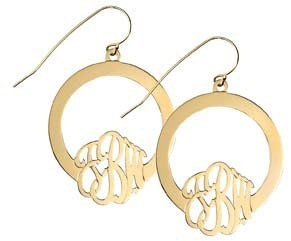 Stunning and Statement Making, 1 1/2″ Hoop Monogram Front Facing Earrings by Jane Basch are available in Sterling Silver or Gold Filled. As all earrings are custom made to order especially for you, they are not returnable. Please allow 3 weeks for delivery. Click Here to View All Items by Jane Basch.